I am really excited to share with you guys this amazing Thanksgiving Collaboration I am apart of with three amazing girls who share the same passion of Vegan cooking as me. With Canadian Thanksgiving around the corner (October 10th) we paired up to share some amazing recipes with you guys that you can make to impress your guests on this special day! Today, Wednesday & Friday we will be sharing a different recipe with you that will “Wow” your family & friends tastes buds. To find the girls and their recipes, I will link you their blogs. So whether you are hosting Vegans, the only Vegan at your own house, or having a fully Vegan Thanksgiving, we hope these recipes will give you inspiration and will help you feel more at ease about scrambling to figure out which meals you would like to serve. 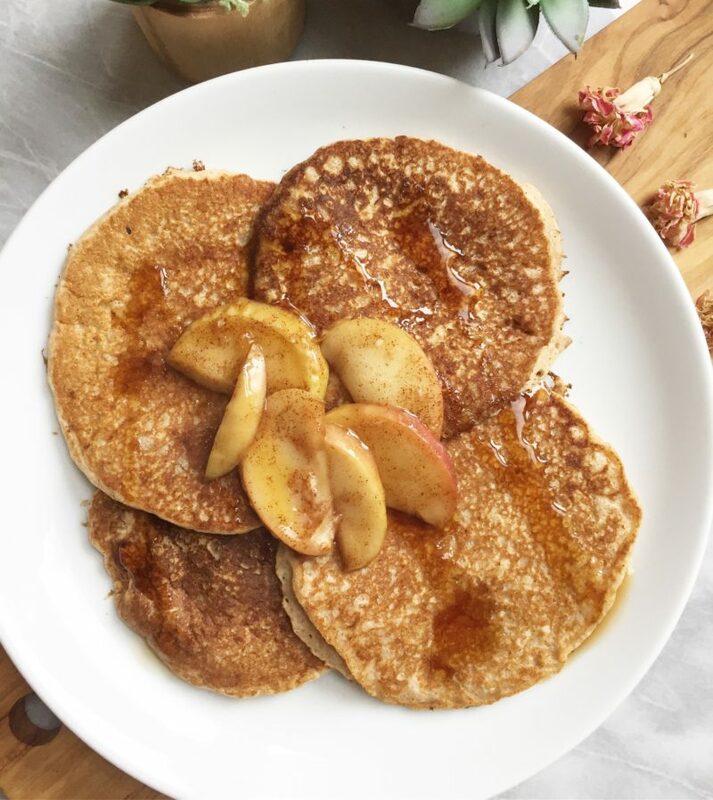 These pancakes are obviously not meant for the main dinner, but could serve as a great brunch or a way to use up the leftover apples in your fridge! Apples are one food item that makes me so excited for fall and I cannot get enough of them. 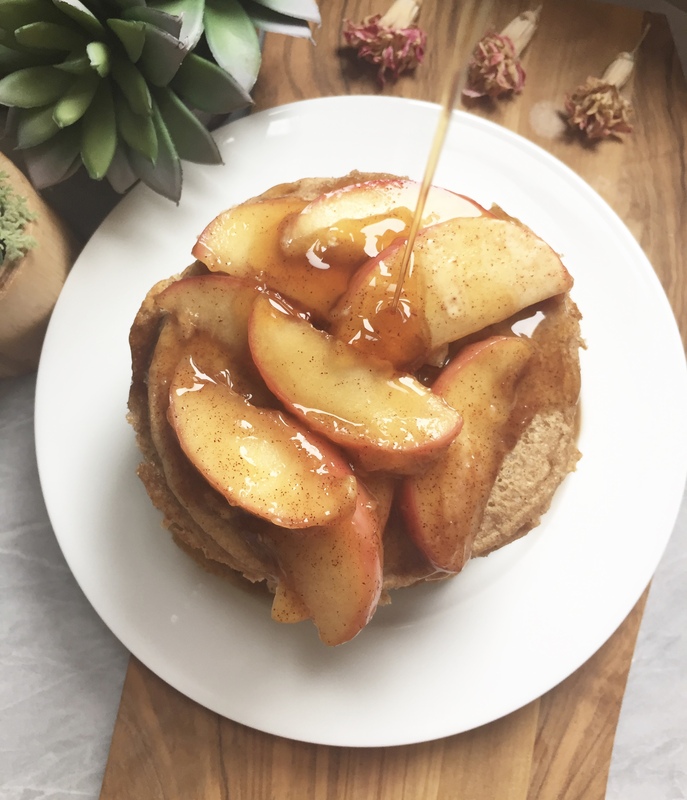 One recipe I love to make are pancakes and I thought combining the two would make the perfect recipe to help jumpstart your Thanksgiving day and help you get in that cozy Fall mood. The apple flavor is not overpowering, but is the perfect balance. The addition of Cinnamon adds the perfect Fall flavor that rounds out the entire recipe. These are also gluten, refined sugar and oil free. I also added a really nice apple toping that gives it more of a “pie” like feeling that is also extremely easy to make. I hope you enjoy this recipe and look forward to new recipes this Wednesday & Friday for your Thanksgiving Feast! Don’t forget to check out the girls and some of the amazing recipes they’re doing as well. In a small sauce pan, add 1/3 cup of water. Add the sliced apple and let come to a soft boil. Add maple syrup & cinnamon and let cook until apples have softened. Add your corn starch and allow to thicken up. Begin by grating your apple (Peel off) and set aside. In one bowl, combine dry ingredients and set aside. In a second bowl mix together your wet ingredients (except apple) and slowly combine into the dry ingredients. Gently fold in your apple. Heat up your large pan on medium heat and add some non stick spray. Add pancakes and allow to cook for 1-2 minutes on each side and repeat until batter is used up. Top pancakes with your apples and enjoy! The recipe says 1 Cup Gluten Free Pancakes (I use spelt flour) do you mean 1 cup gluten free flour? This looks yum I love all things apple! Yes I do! Thank you for the comment I am going to go ahead and adjust that now 🙂 Me too! Apples are life.